Sunderland’s assistant manager has opened up on his Premier League dream, but admits that he and Jack Ross have a ‘massive job’ to realise it. James Fowler was a key part of Ross’s success at Scottish Championship champions St Mirren and has followed him to the Stadium of Light. The pair are preparing to welcome the first-team squad back for pre-season training on Wednesday, and Fowler has been thrilled with the facilities on offer. The 37-year-old told the Daily Record: “You think of Sunderland as a big club. But until you’re here and seen the facilities, you don’t fully appreciate it. “The recovery pools, gyms, undersoil heating on the training pitch – they probably take stuff like that for granted. “Then you go to the stadium and see the size of it. It’s where you want to be as a coach. “As a player, you want to play at the highest level and it should be the same in management. “Being in League One isn’t ideal for the club, but we’re here to do a job. “When we first came in, we just thought: ‘Wow.’ I’ve had loads of texts and messages from people who want a job here – even as our groundsman or bus driver. “That’s because they know how positive we are about the place. We felt at home straight away. “It’s a massive job to get this club back in the Premier League. We missed out on that level as players. But as coaches it’s a possibility. Fowler was himself a highly-rated young manager north of the border, working at Queen of the South. After leaving that role he linked up with Ross and their success attracted the attention of several clubs. 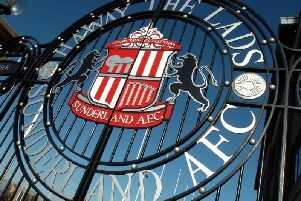 Sunderland won the race for their signature and hope to benefit from their close relationship. Fowler said: “Jack and I didn’t have much of a relationship prior to working together at St Mirren. “We knew each other because he’s from Falkirk and I’m from Stirling. “But it wasn’t like we were buddies who’d text or phone each other. “We’d have a chat and discuss my next move. “Obviously, he kept that in mind when he joined St Mirren. And we did click fairly quickly. “You never know how things will work out, but, if you look at the results and performances, we’ve worked fairly well as a team. “Even our families are close now – our wives and kids get on well too. “When you’re working so closely with someone – and you put in the hours that we do – you strike up a relationship. “We’ve lived and worked in each other’s pockets for two seasons. “We’ve spent a lot of time together, with a unit of staff behind us. “We need to recreate that at Sunderland. Everyone has to feel they’re playing their part and pulling their weight. “If we do that hopefully we’ll get the same outcomes. “Jack’s management of people is one of the most impressive things about him.